Maclocking assign mac address to port so unauthorized devices cannot send frames through this port. Maclocking is also a great tool to prevent against macflooding attacks and also in some case mac spoofing attacks. Enable trap in case of violation. Enable aging for mac addresses(default is 300 secs). Set limit dynamic mac addresses per port. Set max static mac addresses per port.In most cases “1” is sufficient,e.g.for servers but you can adjust it in accordance to your needs. Enable maclock feature on ports. On port where other switches are connected the best option is not to enable it. Enable maclock globally.From this moment your mac locking started to work. Change dynamic addresses to static on particular port. Show statically assigned mac addresses. Show dynamically assigned mac addresses. 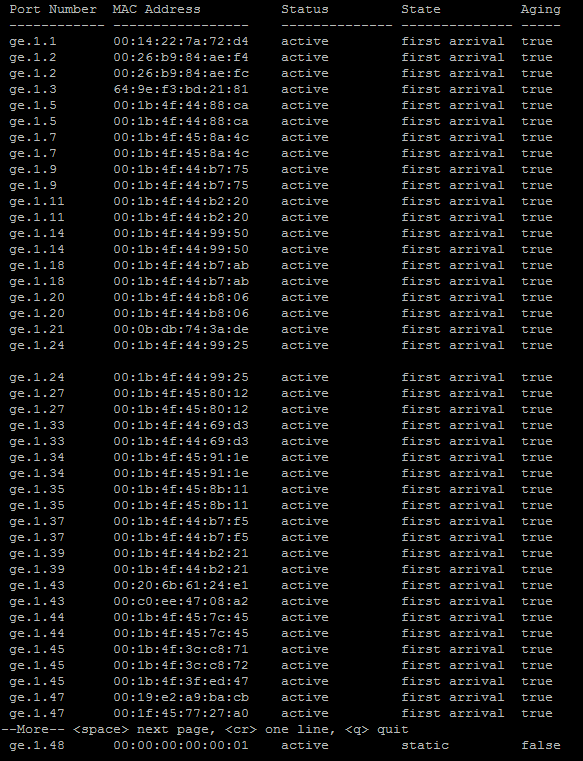 Show all assigned mac addresses.